Cook the rice till soft (not too soft). In a kadai put one teaspoon oil and fry urad dhal till it becomes light brown. Add green chillies split into two and ginger chopped and fry for a while. Add tamarind and fry. Finally add chopped coriander and fry everything together for few seconds. Cool it. Grind this to a fine paste. In the Kadai put the remaining oil and when it is hot add mustard. When it pops up, reduce the heat and add cooked rice, salt, ground coriander paste. Mix well keeping the flame to low. Once everything blended well, remove it. Tips: You can also add fried cashew nuts or ground nuts and a tablespoon of fresh coconut gratings for garnishing. I visited your website just now.the receipes are quite interesting.I copied the coriander rice receipe.tomorrow I am going to try. Thank you for visiting my site. 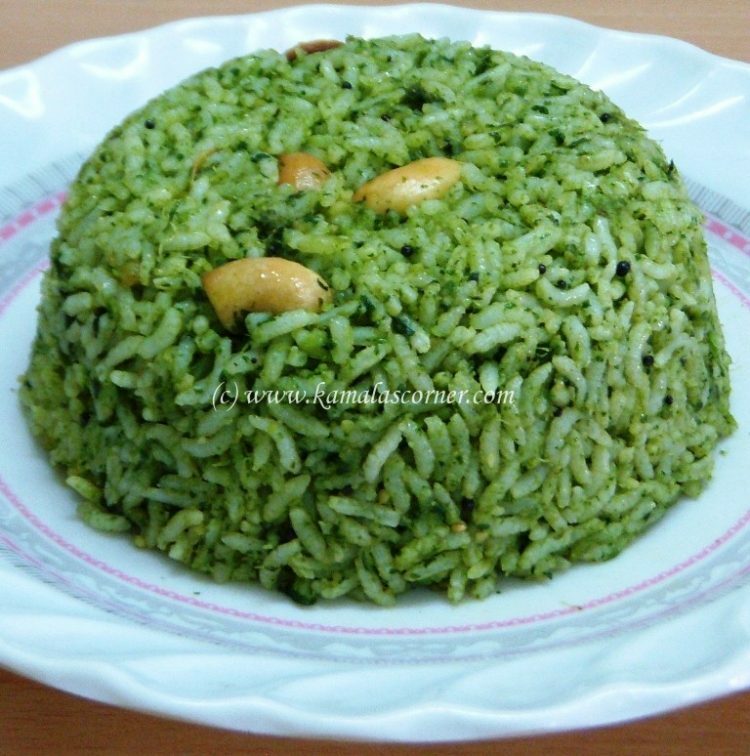 Please try this rice and let me have your feedback. Thank you Vasanth Kumar for your feed back. coriander add little masala powder and fry till the raw smell goes off.then add either green peas or potato pieces.then put basmati rice and add coconut milk. Thank you Devi for sharing your recipe. Thank you Gayatri for trying this recipe and your kind feed back on this. Wonderful recipe – my husband loved it. Thanks!